Kayaking can be a very relaxing or very thrilling sport. That depends on whether you prefer paddling through harrowing canyons or calm waters. But at the same time, regardless of where you paddle, there will always be a specific element of danger. However, the danger can be radically minimized with just a little foresight. Here’s everything that you need to know about the real dangers of kayaking. Is it dangerous to kayak in the ocean? Do I need a license to go kayaking? Do I need to be fit to go kayaking? How difficult is to learn kayaking? Can I take my dog on my kayak? There are plenty of misconceptions about the dangers of kayaking. A good chunk of them is just perceived, not real dangers. Therefore, we must first clear the water from that, before we proceed to the real ones, the ones that matter. Perceived risk is an idea that we might have about how scary some activity it is and how risky it is to do that. For example, some might see skydiving as extremely scary and risky, while in fact, it isn't. There is actual data to prove that the perceived risk of skydiving is high and unjustified. Another example is old folks and their thoughts on traveling abroad. Many still believe that it can be risky and dangerous. That's the very definition of perceived risk. On the other hand, an army of young people that like to travel a lot, know that there is no harm in traveling abroad and that the risk is minimal. Kayaking has been around for some time, yet the perceived risk is still there. At least with some folks. The reality is quite the opposite. The reality is there are some risks, but nothing like they see it. When done properly, kayaking is one of the safest sports around, and that's pretty much a fact. We’ve made this list of the real dangers of kayaking and how to avoid them to debunk some common misconceptions. Sometimes when you enter water that is way colder than the surrounding, the body stops to function properly. Anyone that has ever jumped into super cold water knows that feeling. You will feel like your head is about to burst and as if your breath was forcefully removed from your breasts. The trick here is to get acclimatized yourself to cold. Enter the water slowly and take your time. And make sure that you have someone else next to you. That’s because you may still fall in cold shock, even though you are going in slowly. Hypothermia is a physiological reaction to continuous exposure to cold temperatures. It results in a decrease in core body temperature. One of the fastest ways to get hypothermia is to be exposed on extremely cold water. Kayakers can combat this by wearing suitable clothing. It is that or staying at home during the extreme conditions and harsh cold weather. But if you don’t want to miss out on kayaking, even though it's freezing cold, make sure that you pack an extra set of dry clothes. Sweepers are obstacles and low hanging branches just above the surface of the water. They might look like nothing, but they can be very deceptive. A small branch in the face can make you lose your balance and make you fall in the water. Therefore, don’t take any chances to paddle around them. Strainers are the opposite of sweepers as they are submerged obstacles. Being caught in one and if there is a strong current, it becomes a lethal combination. There is no way to tell how big the strainers are and how stuck you can be. If you notice some, stop paddling and look around. Maybe even backpaddle so you can better assess the situation. If you are kayaking in an area that is known to have plenty of strainers don’t go alone. Make sure that you have a partner that can help you get out if you find yourself stranded by some strainers. This is especially dangerous. Weirs are humanmade river obstruction designed to control river levels. They are built when a full dam cannot be made. The real danger is on the downstream of the weir. 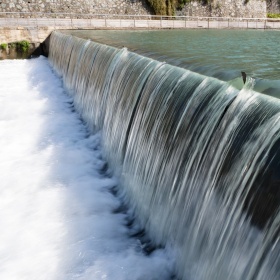 It is called weir hydraulics, which is a self-circulating current of water. And anyone caught in it is trapped into a never-ending cycle of re-submersion. If you notice one stop! Don’t go over it, don’t go near it. Paddle as far as possible from them and don’t take any chances. The video below shows how dangerous the weir hydraulics is. In the world of kayaking, an undercut is an underwater hollow depression. Sometimes, mud banks or rock ledges can create a large undercut. One that can easily trap a person. The thing with undercuts is that usually, they are not visible from the surface, at least not until it’s too late. If you find yourself in such situation, stay calm while trying to figure out how to help yourself. Wearing a life jacket can make a huge difference. Too many times people have underestimated continuous sun exposure and what that brings to the table. Constant sun exposure can cause stroke, dehydration, heat exhaustion, and other conditions. The best way to avoid getting any of those conditions is to always stay hydrated (drink plenty of water), wear light colored clothes, sun hat, and sunscreen at any time. Any type of necklace around your neck can be considered as a lurking danger. You don’t need anything like that while on the river. Necklaces can easily be caught by some branch, and you can find yourself fighting both the river and the necklace that's strangling you. Just leave all of your necklaces and jewellery in your car or at home. Wearing a life jacket or PFD (personal floating device) is essential. But it doesn’t work if you wear it loose or if it's not as per your size. Also, it won’t do any good if it is a cheap knock off that doesn’t do anything. Before you buy it, you need to make sure that it is rated for your weight and size. The PFD should be able to slip past your ears and shouldn’t feel uncomfortable. All you need to do is, considering the right size and a reputable company. So don’t go for the cheapest ones. The ocean tide current can be quite strong and take you far into the ocean without you even realizing that. Both tidal and rip currents have the potential to get you well of your trajectory. The trick here is to notice when you are being carried away and fight it off. Dealing with strong tides requires some time and energy on your side. The ocean is one of the most unpredictable environments. One moment it is nice and steady, the next one you are facing waves as big as your house. If you find yourself in such situation, remain calm and start paddling towards the coast. There is no point in trying to go against the storm. Big ocean ships can be very dangerous to kayakers. They can be deceptively fast and if you are not part of a larger group they might not even notice you. That is why it is important to wear bright colors and never try to cross their path. Sudden thunderstorms are nothing new in the ocean, and they present a real danger to kayakers. If you see lightning in the distance, start paddling towards the shore. Also, put your head down and make sure to remove any metal from you. Sharks are way less dangerous than the things mentioned above, but they are not to underestimate. The odds of you hitting into a great white are the same as you hitting the lotto. It is even rarer for a shark to attack your kayak. 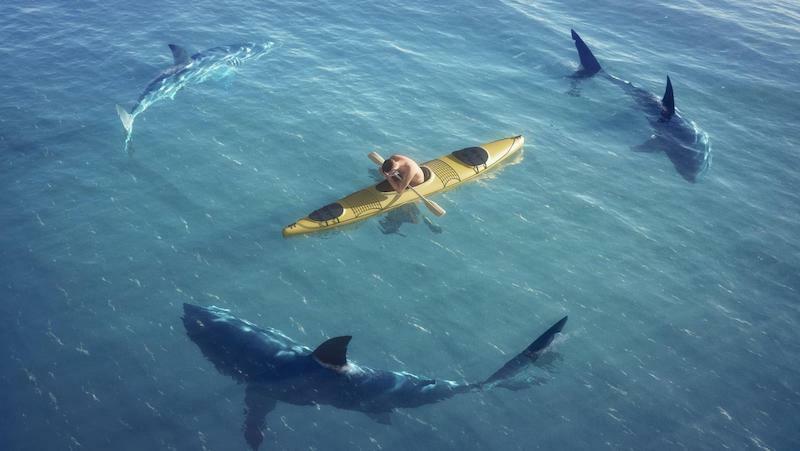 However, the sight of a shark circling your kayak can be intimidating. It is important not to panic and paddle as far as possible away from it. Preferably towards the shore. In any case, it’s the best not to go kayaking in areas in which there are sharks. Remember, there are sharks even in shallow waters. In most cases, narrow crates create fast currents that can flip your kayak. If you notice one stop for a moment and evaluate it as closely as possible. Sweepers, strainers and weird hydraulics are dangers that are common in rivers and were already well-explained above. Dams are always a danger to kayakers. Especially if the water is leveled with the dam and you are not aware of it. If it is your first ride on that river, you might be tempted to go above without even realizing it is a damn. Sometimes river boats get carried away by river streams and end up hitting someone or something. 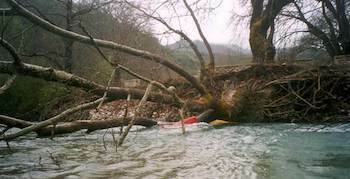 There are cases in which riverboats have crashed into kayaks. In each of those cases, it is the kayaker that ends up on the wrong side of the stick. Wavetrain is a series made of non-breaking waves. 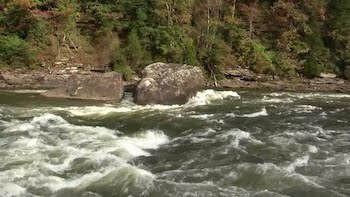 Some kayakers might add other types of rive kayaking dangers, different than the ones here. They might be real and based on real-life experiences. But at the same time, they are either specific to only some types of rivers or extremely rare. For example, some would say kayaking in the Amazon is dangerous because of the piranha that lives there. So yes, piranhas are dangerous, but the danger is only there. There is no danger of piranha in rivers across the world. Another important point is to make sure you get the right kayak for this activity. There is no such thing as a kayaking license. But, before you go kayaking, it is recommended to take some kayaking classes or go with someone that has experience. Kayaking is a sport in which you depend on your ability to paddle and keep balance. But then again, you can paddle as much as you like. There is no limit to how far you should go or for how long. You set your boundaries and goals. Your fitness is essential, but not something that can keep you off your kayak. The learning curve is quite small. There are just a few simple moves that you must learn before you start kayaking. Beginners are always encouraged to take lessons first or start with an experienced friend. You can also get a tandem kayak so that your experienced friend can help guide the way. Check out this article for a good quality 2 person kayak. Technically yes, it is possible, and you might have seen videos of people kayaking with their dogs. However, they are all experienced kayakers, and it is very likely their pets have been trained to remain calm while on the kayak. In any case, it is a complex issue, and there are a lot of things to be taken into consideration first. Check out this article if you would like to know how to take your kids or dogs on a kayak trip. Some of the stuff mentioned here is probably new to you, while others not so much. Nevertheless, everything needs to be taken into consideration as all of that comes from a place of experience. The tips and pieces of advice are all derived from people that have years of experience and well versed with the many dangers of kayaking. Kayaking can bring tons of fun and joy, but only if you take care of your kayak and equipment properly. Be careful, do your research, take precautions, and make informed decisions. Just stick to what you learned here, and kayaking will be all about having fun and connecting with nature. I’ve been an avid camper for years and always wanted to try kayaking but I’m not the best swimmer so I’ve always been a bit apprehensive about it. This is a great safety guide! learning more about the dangers has actually made me feel less scared and more prepared… who’d have thought!